Excerpts and photos from “Bandon,” by Robert Miller and Reg Pullen with the Bandon Historical Society, Arcadia Publishing 2013, used by permission. Generations of Oregon Coast cranberry farmers have applied muscle and ingenuity to growing and harvesting their crops. 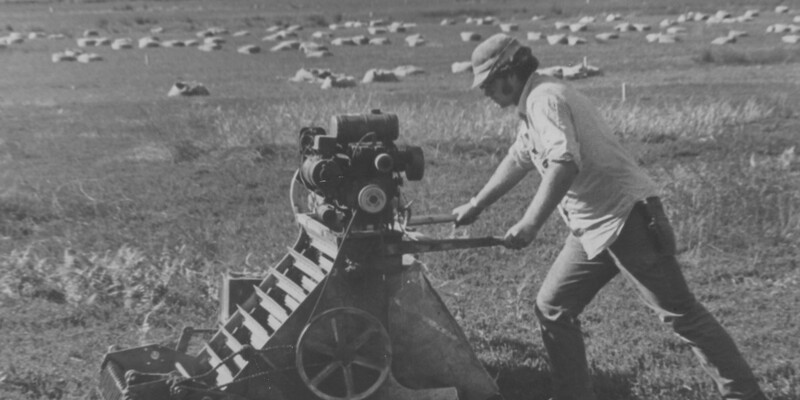 The mechanical picker, forerunner of the present day wet harvester, was developed in Oregon! 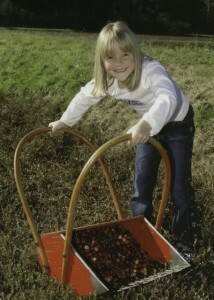 Picking by hand is the most labor-intensive method of harvesting cranberries. The slow, hard work had to begin in mid-September to be completed before the November winter storms. Pickers were assigned rows and typically engaged in friendly competition. Handpicking was gradually replaced by the use of wooden scoops, which speeded up the harvest. Harvesters utilized a wide variety of scoops ranging from small scoops for women and children to long-handled Wisconsin scoops for tall men. 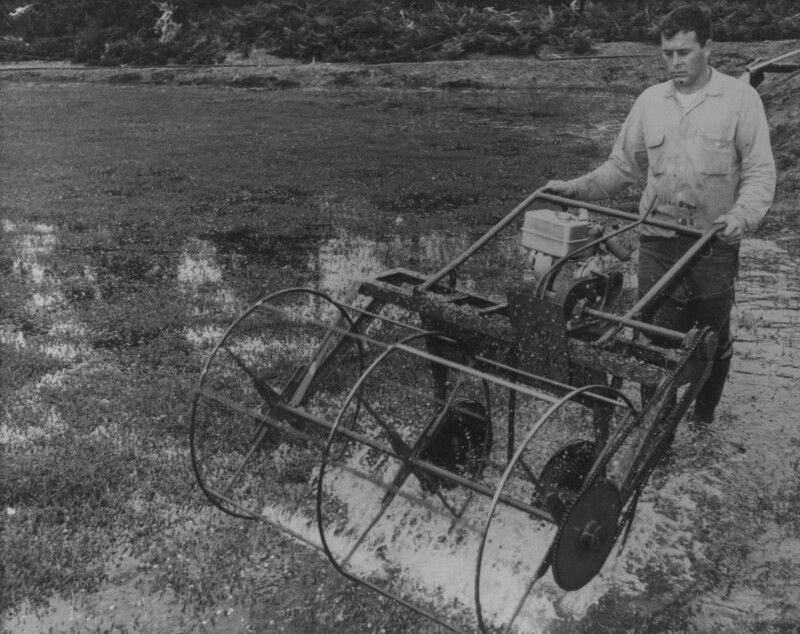 The Oregon-based Stankavich brothers—Joseph, Michael, and Matthew—developed the first mechanical picker in the United States. This method greatly speeded up harvest on dry land. The mechanical picker is still in use today because of the high value of fresh fruit, but its liabilities include the great strength required to control the machine, the high percentage of lost fruit, and incidental damage to vines during harvesting. Mechanical beaters efficiently knocked the berries off the vines; and growers soon learned that riding on top of a beater was more efficient than walking behind it. Growers modified beaters to suit their farm’s needs, and beaters became bigger, faster, and more efficient. A two-acre bog could be harvested in a few hours with very little lost fruit. as fruit juice became an important part of the market. New techniques were needed to rapidly harvest the crops. 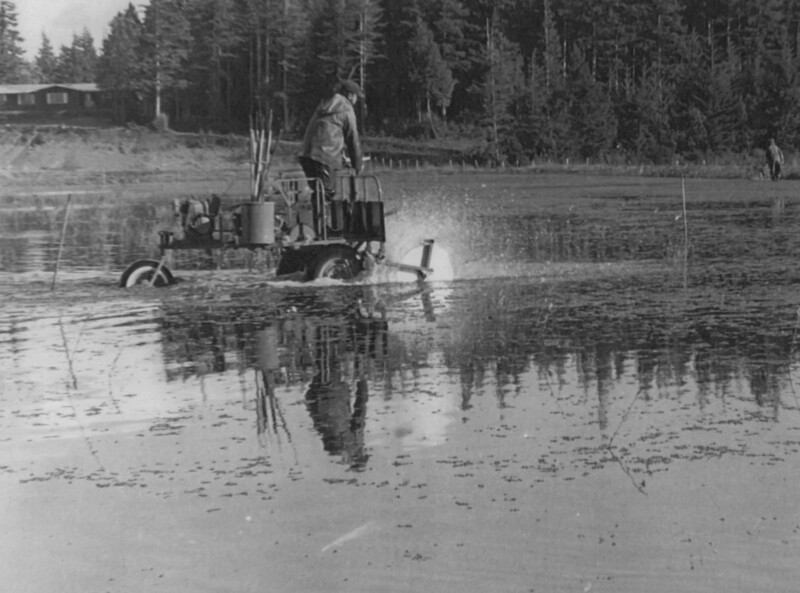 Cranberries float, so one solution was to grow them in bogs and flood the bogs at harvest time. Visit the annual Cranberry Festival exhibit at the Bandon Historical Society in August and September. Annual festival displays include Cranberry Court Coronation dresses and festival memorabilia along with the regularly featured cranberry growing exhibit. Copies of the “Bandon” book are available in the museum gift shop. The Bandon Historical Society Museum is open February through December, 270 Fillmore Ave SE. Images, from top: one of the first mechanical pickers; Hannah Tomasini with a small wooden scoop, 2006; Fred Richert harvests cranberries with a beater, circa 1960; Harold Russell, a longtime Oregon member of the Ocean Spray board of directors, wet-harvests cranberries, circa 1970.